If we had been heading east the day would have been one of the easier ones but alas we’re going to Dordt College and that means we’re riding north for a couple days. I got all the photos online from the past week (week 5 album link) so check them out. I probably won’t bother integrating them with the blog so you’ll have to mix and match with which stories go with which photo. This past weekend we were staying in the town of Fremont Neb. There is no CRC church there and for sunday service we had the option to be bussed out to either Lincoln or Omaha for a seatosea celebration service. Upon our arrival to camp some of the riders who had opted to stay in Fremont had attended the Lutheran Church across the street from the hockey arena we were camping out front of. Within a couple hours of their church service finishing and learning that there were 150 people camping out in the 105oF heat their church had been turned into a hosting center for us. There were brownies being baked, endless watermelon and cool drinks. There was wireless internet available and they even let some of us sleep in their facility overnight to escape the heat and humidity for even a few more hours. What a fantastic example of partnership within the greater church, we all felt so blessed to become the first priority of some members of that church on a day they expected to be hosting no-one! Last night I slept in the arena because it was downright cold and more like sleeping at home in Edmonton when it’s 30 below with the window open a crack… it was great. I decided to make the most of it and slept right until 7:15 giving myself 15 minutes to pack up, grab a lunch and put breakfast on my plate. I scraped by just in time as breakfast was promptly removed from the table at 7:30 because the very first people had already eaten 2 hours earlier. I made a mental note not to take any cottage cheese when eating breakfast so late, it’s something that is rather disgusting when warm. Anyhow, after getting sunscreened up and putting in my contacts and sitting around talking with Steph for a bit (she didn’t ride today so was also not rushing out of camp) I hit the road at quarter past 8 am… right at the tail end of the group. The route this morning was spectacular and much enjoyed, I felt a wee bit like I was riding in the hills north-west of Edmonton just where the Alaska Highway starts. There were patches of trees here and there, the fields chock full of crops and there were loads and loads of birds flying around. That stretch of road lasted for the first 50 kms or so and then I dropped out of the hills into the Missouri River Valley, the rest of the day was spent on pancake flat land. 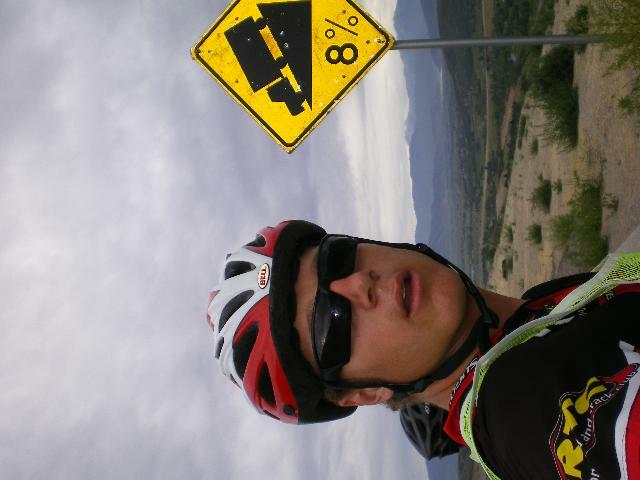 Rolling into one of the towns around the 85 km mark I heard some bad news. Eritia had T-boned a car about 20 minutes prior. I have probably ridden more kms with her than any other person on this tour so far, I’m comfortable enough with her riding to draft within 4 inches or so of her and the same the other way around. Josh has even commented that he was kinda surprised at our efficiency zipping down the road. I was not very pleased by the news having lost Tyler to a broken shoulder, one of the others I’d ridden loads and loads with, only a bit more than a week ago. While the story got straightened out it began to sound more and more like people were trying to get her bike fixed. That was good news, she intended to ride the rest of the day. I poked my head in the back of the gear van and said hi. With a smile on she was bragging about how she completely destroyed the driver side mirror. Later on at camp she seemed to be doing OK and has gone to sleep with Barb Mellema (Cyclist from the area) in a real bed tonight. No doubt though she’s going to be stiff tomorrow and likely have a couple bruises. Keep her in your prayers please. From then on the story of the day was headwind headwind headwind. The final stretch of 20 kms Lawrence and myself switched off pulls and made really good progress into town… 45 kph effort for a 30 kph reward. Thanks for all of the offers for help regarding the dérailleur hanger. I do have one in shipment that should be meeting me tomorrow at Dordt. I picked up a new chain at the bike shop today (almost 6000 kms on my last one) as well as a couple new tyres, some new handlebar tape and a sweet new jersey that was half off. It’s now my favorite and will make an appearance in some photo at some point this coming week. Stay tuned. Today was a good day on the road as far as cycling is concerned. We began with a headwind and downhill similar to how we finished up yesterday. Tyler and myself took turns shifting off up front and then freewheeling in the rear. The first hour and a half resulted in an average speed of 36kph and we picked up Eritia along the way. 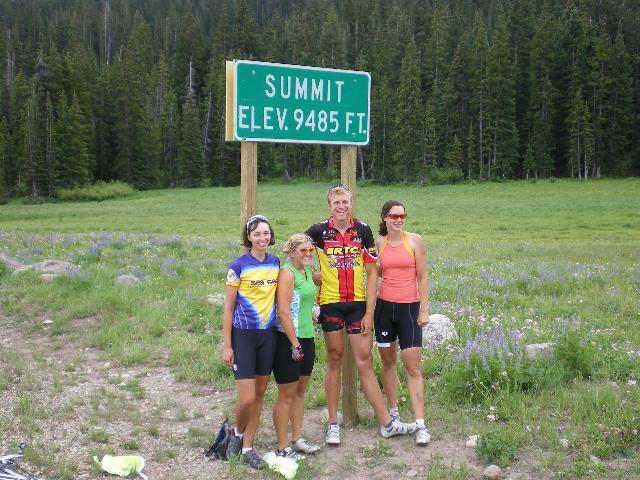 Following a 10 mile climb into the town of Vernal we had caught Matt Zanting, Hans Doef and Laura Holtrop. Eritia and I joined their group and Tyler went off with some others to explore a bit of town. After stopping in at an outdoors store and the bike shop we sat on the feet of a giant pink dinosaur and ate a bit of lunch at quarter to 11 am. From there on out we had another 10 miles of downhill (again in the mid forties for speed) and the day wound up with a 20 mile gradual climb into the little town of Dinosaur. We do indeed have showers here but the visitor center at the national park has trouble with a shifting foundation and is closed. So all of us that hurried out here so we could go check out the national park are a bit lacking with things to do. Some of us are going to go buy a bag of ice and have a bit of cold therapy for some of them muscles. We’ve got another medium difficulty day Wednesday and a tough one on Thursday. I’ll be on the sweep crew for Thursday which should make for a very long day on the road. Regarding yesterday’s prayer items, Stephanie left camp and turned around after 4 kms aware that she had swelling and fluid on her knee, she doesn’t plan to try and ride tomorrow either. Art is still undecided when he’ll give riding another kick at the can. I’ve put in 1378 kilometers in the past two weeks. A total seat time of 50 hours and 17 minutes, which puts my average speed around 27.5 kilometers per hour. Strength: This week will likely be the most challenging yet. We’re still heading through the desert and temperatures are hot. The daily rides are also longer (averaging 120 kms per day this week) and as a result most riders will not be able to finish before the heat of the day as we were able to do this past week. Patience: Not only for long rides and long hills, and maybe Saturday’s challenging ride will require that… Actually though, as the daily riding is turning more and more into a routine the less natural it is to make concessions for this and that. A spirit of camaraderie among the cyclists depends heavily on our intention to do so. We’re planning another detour on Tuesday to visit some sand dunes that are a bit off course, I’ll of course keep you posted on how that materializes. I hope to write again soon but this is all for now. I arrived safely in Seattle on Saturday afternoon after a bit of re-routing. Everything turned out great and I got to pay a bonus visit to Vancouver as a result, all my bags are here and my bike which was taking a ride on top of a fellow cyclist’s car has arrived in working order. I’m ready to get riding! Meeting cyclists has been the project of the last couple days. I think I’ve met close to 100 of the ~150 that are here and think my retention rate is about 50% which is great. 150 people, it looks way bigger in real life than it does on paper. The contingent of tall blonde dutch-herrtiage males is hilarious. We had a worship service this morning, apparently the tradition of claiming the pews in the back of the auditorium first isn’t unique to River Park Church. There are still bikes missing in transit, pray that the airlines and couriers can sort out the details before tomorrow morning! It’s hot, it’s a common source of discussion and even though it’s only going to get hotter as we enter the desert towards the end of the week pray that cyclists deal well with it. Pray for unity, the first few days of meeting and greeting and forming friendships is really going to form the community for the next nine weeks. Thus far it’s been great and diverse interaction between demographics, countries etc etc. That’s it for now, the first celebration service is tonight and we’re dipping tyres in the pacific tomorrow at 9am PST. If you’re interested there is a rumour that this will be broadcast online (live). I assume you’ll be able to find the link from the official website. I appreciate the comments and emails… keep them up it’s great to know there is a fan base out there! This morning McKernan Baptist, the church I’ve been attending in Edmonton for the past 4 years has a commissioning for all of the people doing “kingdom related work” this summer. 17 people were sent out from just that community to go make a positive impact on the world for Christ in the next 4 months. God’s abundance seemed to be so evident. It was a really good experience to be blessed by that congregation before I departed Edmonton, Pst. Sam prayed specifically for guidance in preparation, something that’s been tricky in recent weeks. I am quite aware that I’m leaving Edmonton soon, have I really asked all of the people for support that I should have asked before I split from town? We also prayed that God would pour into us an extra measure of courage and clarity with regards to opportunities to share the gospel. That’s also something that’s been going through lots of cyclists heads in recent weeks. There has been a discussion going on with regards to why in the world we’re going on a bike ride along with this fundraising. The ultra-brief answer in my mind boils down to being a witness to our world. If through cycling there are opportunities to communicate the importance of caring for the poor then by all means it’s not a pointless endevour. Does that make it a worthwhile endevour? Well I guess I’d like to chalk up some quantifiable level of awareness at which I think this becomes worthwhile. If I can communicate well to one completely different person each day the reasoning behind my biking then I by all means am on the right track. Is one person enough? I think that if I start down that road I’m going on a bit of an adventure in completely missing the point, but here’s what I do know. It requires a good dose of courage and a clear mind to be making that conscious effort from day to day. Six nights of accommodation for the Tour this summer remain unconfirmed. Would you please join in praying that the leads that are currently established would follow through and that the location in upstate New York would be sorted out. It would be a great relief to the organizers if all of these locations could be sewn up in the next weeks. In another line of prayer, there are currently numerous riders who anticipate participating this summer who are dealing with injuries. Some of them are frustrating inconveniences like broken hands that aren’t likely to impact riders’ success this summer but some other riders are dealing with knee trouble and other cycling related problems. The health and strength of all members of this summer’s itinerant community will make a big impact on the extent to which those weeks will be so much more of a blessing than a chore.